South Brooklyn, 1947, Palm Sunday afternoon. Palm fronds cover a kitchen table where the nonnas sit weaving strands into sculptures. Each twists and braids and ties the green- edged leaves into crucifixes, wreaths, and miniature crosses. They glance at one another’s creations admiring the braiding technique, but never saying so. The man of the house is on his way out as he walks past the table and glances at the women’s work. He picks up a miniature cross, two tiny strips of palm inserted one into the other and slips the cross into the grosgrain band of his fedora; it adds a jaunty touch to the dark brown felt. Once talk of the baking starts, it does not stop, because the nonnas’ kitchen capers – never mind their seven-fishes act at Christmastime — reach a crescendo at Eastertime with the baking of the chock-full–of-everything pizza rustica. “You got some people to help you?” one asks. “Yes, even my daughter-in-law says she’ll help,” a reply that meets with the nonnas’ sly grins and delicate eye-rolling. The baking begins on Spy Wednesday, the Wednesday before Easter. In every nonnas’ kitchen on baking night, an enamel-top dining table overflows with chunks of Genoa and Sicilian salami, hot and sweet sopressata, dried fennel sausage, heels of prosciutto, balloon-shaped balls of scamorza, wedges of Fontina and Asiago, and balls of fresh and smoked mozzarella. There is also the once-a-year specialty, basket cheese, dripping whey on a folded kitchen towel alongside a perforated tin of creamy ricotta. It is time to make pizza rustica. In one kitchen, a nonna commands a daughter-in-law, “Hurry, beat the eggs in the big bowl.” The younger woman begins beating and makes a face when the nonna turns away. “You,” the nonna shouts to two grandsons, “Get busy on the cheese.” The boys begin to dice the cheese and occasionally form bits into balls and lob them at each other, when the grown-ups are out of sight. The nonno, a juice glass full of red wine at his side, sits at the head of the table carefully dicing the meats into half-inch cubes. “You, stop playing with the cheese,” he addresses the boys. “If I throw a piece of prosciutto, you’re going to be black-and-blue-for a week.” The nonnas buy only the heel-ends of the prosciutto because they’re cheaper — so dried, the hunks could easily serve as weapons. “I know, I know,” her husband says “and then Good Friday, three hours more in church.” He dismisses the whole deal with a wave of his hand. In a while, the pie is assembled. The nonna brushes the top with beaten egg for a gloss, makes a sign of the cross atop the baking pan, and puts the pan in the oven. There is no eating the finished pie until Holy Saturday, after the Mass of the Resurrection, the official end of Lent. With the Alleluias still ringing in their ears from the glorious Mass, the nonnas rush home to cut the pie, wrap individual pieces in waxed paper, and pack them in brown paper lunch bags. They dispatch grandchildren in pairs to deliver slices to nonnas, uncles, aunts, and friends. The children do not have far to go: sisters live floors away from sisters-in-law in four-story buildings. Cousins can call out of windows to cousins. Aunts are a fire-escape climb away. No one lives more than three blocks away. The grandchildren return clutching a cache of slices from nonnas, uncles, aunts, and friends. Then the critique of the other pies begin. “This pie is too salty,” a nonna says. That pie is too sweet. This crust is too thick. That crust is too thin. The verdict in each nonna’s household: Her pie is the best. Combine flour and salt; place in food processor, or electric mixer at low speed; work butter into flour mixture to form coarse crumbs. Gradually add enough water to form a dough that just sticks together. Wrap dough in waxed paper; refrigerate while preparing filling. In a large bowl, beat together ricotta, eggs, and black pepper; set aside. Dice meats and cheeses into 1/2-inch cubes; combine diced ingredients in another large bowl. Divide dough in two, with one piece slightly larger than the other. On a lightly floured board, roll out larger piece, and fit it into an (approximately) 12-inch-by-16 –inch nonreactive shallow casserole; leave an overhang of 1 inch. Roll second piece of dough to fit over top; set aside. Pour ricotta-egg mixture over meats and cheeses; stir well. Moisten the edge of the bottom crust with water; add the meat and cheese filling. Add top crust; crimp edges of crust together; flute edges. Brush top crust with egg glaze; cut a circle in top crust to allow steam to escape. Place casserole on baking sheet; bake 90 to 115 minutes or until the tip of a knife inserted into the center comes out clean. Cool on wire rack; allow to come to room temperature before slicing; serve at room temperature; refrigerate leftovers. This is so evocative of a specific time and place. I visited the Tenement Museum at Christmas in NYC and although the Brooklyn described here was probably a little more comfortable than the Lower East Side in the ’40s it was still so easy to picture the competitive nonnas fanning the kids out with their rusticas. I am definitely going to scoot on over to North Beach and go sausage shopping this Easter and attempt this dish! Wonderful writing! Growing up in Maine, as a Catholic Franco-American, I can remember the Easter ritual of the weaving of the palms. But there the resemblance with your piece ends. 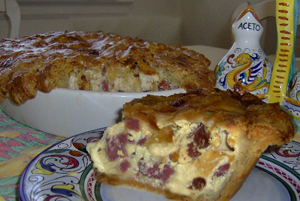 We never made anything that remotely resembled the delectable pizza rustica. It would have been impossible to find many, if not most, of the ingredients. And even now, in Central Maine, I would have a hard time finding some of the ingredients. I’m missing my mother so much these days. She left me her recipe book but neither this nor her Easter grain pie recipe were in there so it is a special joy to find these recipes. Living in Southern California, I have no idea where to find the wheat or the orange blossom water but I’m sure I’ll find them on the internet somewhere. I was born and raised on Long Island, NY but my whole family lived in Brooklyn so I have so many wonderful memories of holidays spent all together at my aunts’ houses in various parts of the city. I do miss those days. Thank you so much for the recipes and the wonderful read….I do love those nonnas…..mine made the very best pizza and mozzarella carozza ( spelling??)…..yum! The best way to keep memories alive is to share them through talk around the table. It is most gratifying to serve a dish and say,”My mother made this for us every Easter.” Oh, the memories that first forkful brings.